The global is expected to witness a CAGR of 15.1%. North America currently dominates the market, and is expected to maintain its position over the forecasted period. Nanomedicine is a promising mode of cancer treatment. With the advantage of the properties of matter at nanoscale, nanomedicine promises to develop innovative drugs with greater efficacy and lesser side effects than standard therapies. Nanoscale objects are used by themselves or as parts of larger devices containing multiple nanoscale objects. It has the potential to change the current methods of diagnosing and treating cancer. Translation of nano-based cancer therapies and diagnostics has witnessed significant progress and several more developments are in the pipeline. The increasing incidence of cancer and importance of nanomedicine in modern cancer treatment procedures, are expected to drive the demand for nanomedicines during the forecast period. The other factors includes increasing incidence of cardiovascular diseases, increasing research funding and rising awareness of nanomedicine application. Cost is the main factor that is often overlooked, which is specifically important in the face of ever increasing healthcare cost and unpredictable reimbursement environment. There are several FDA approved nanoparticle-based products in the market, which can be compared with their non-nanoparticle based counterparts. Although these formulations may be more efficient and less toxic than their counterparts, their costs may also be significantly high. The average cost per dose of anticancer drug doxorubicin is about USD 62-162, compared to USD 5,594 for Doxil, which is a nanoparticle containing doxorubicin. Therefore, owing to the inability of the industry to find a cost-effective method of scaling up the production, the cost of nanomedicine therapies is likely to remain high over the forecast period. This high cost of nanoparticle-assisted medicine is hindering the growth of the market. The other restraining factor also include time-consuming product approval. Geographically, the United States currently dominates the market, and is expected to maintain its position over the forecast period. In addition to the booming R&D activities, the United States has also initiated several measures in the recent times, to advance and develop the nanotechnology applications in the healthcare sector. 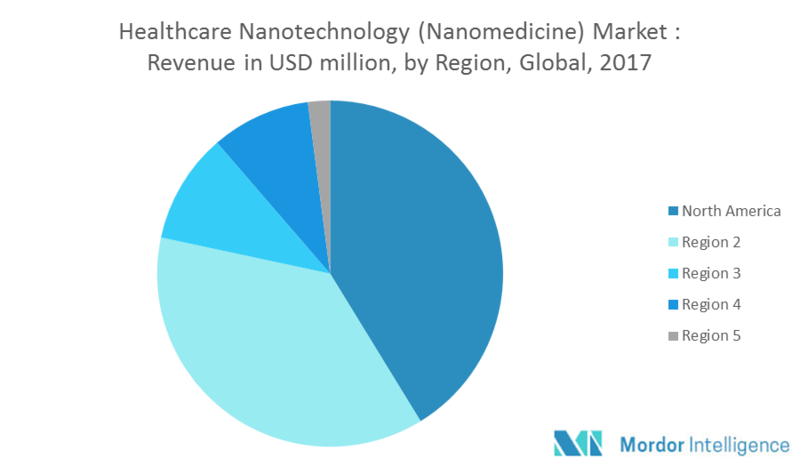 Owing to the large geriatric population, growing need for diagnostics and augmented cancer therapies, government initiatives, and rising awareness of nanomedicines, the US healthcare nanotechnology sector is expected to witness a substantial growth during the forecast period. The key players in the market are Abbott Laboratories, Combimatrix Corporation, Ge Healthcare, Sigma-Tau Pharmaceuticals Inc., Johnson & Johnson, Mallinckrodt Plc, Merck & Company Inc., Nanosphere Inc., Pfizer, Inc. and Celgene Corporation.